Big brothers of all ages will love to own this retro style sweet jar, complete with their name! 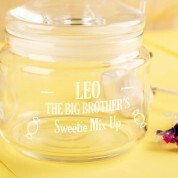 It is laser engraved in house with the recipient's favourite sweet choice and a simple design. 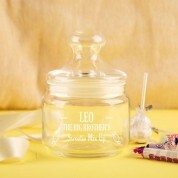 The sweet shop style glass jar makes a timeless gift for Birthdays, Christmases or other special occasions. 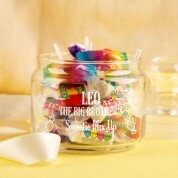 Once he has emptied the jar (it shouldn't take long), he can refill it with whatever he likes. It makes a great storage solution with its handy lid! All designs, personalisation and engraving are done in house by our production team to ensure the best quality is delivered to the customer.